Mixed results for the TWU softball team this weekend down in Kingsville. Carly Case pitched a four-hit shutout for the Pioneers in the first game of the series on Friday afternoon, a 4-0 TWU win. TAMUK, however, came back to win Friday's nightcap 5-4 and then the single-game on Saturday 2-1. 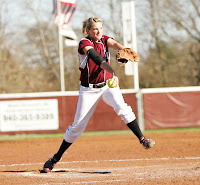 Case (pictured) started all three games for TWU and turned in an admirable effort in the circle. Freshman utility player April Mandel was the Pioneers' top hitter in the series with three hits and four runs batted in. TWU is now 4-8 in the LSC South division standings and will need a strong finish to the season if they want to qualify for postseason play. Speaking of softball, the Pioneers will host the number one team in all of NCAA Division II - the Angelo State Rambelles - in a three-game series later this week. TWU and ASU will play a single game on Thursday night at 7 p.m. and a doubleheader on Friday scheduled to begin at 1 p.m. Fans can get in free to Thursday night's game if they bring a new or gently used stuffed animal to donate to the TWU Softball Help Us Give (H.U.G.) Challenge. The four senior members of the TWU team - Amber Brooks, Ashley Martin, Tiffanie Boone, Kayla Behrle - will be honored prior to the start of the first game on Friday afternoon with a brief Senior Day ceremony. Nationals week is finally here for the TWU gymnastics team! The Pioneers depart for New Haven, Connecticut and Southern Connecticut State University on Tuesday morning, Apr. 7, at 10:00 a.m. Come out to the parking lot by the tennis courts on the TWU Denton campus to see them off. The team semifinals are on Thursday, team finals are scheduled for Friday, and individual event finals are slated for Saturday afternoon. I'll be flying up to New Haven on Wednesday night for the Championships so I'll be able to keep everybody up to speed on all the happenings at Nationals on this oh-so-convenient blog. You can also read the daily Pioneer Posts from the TWU gymnasts. That's it for now...more to come later this week. Thanks to everybody for their continued support of TWU Athletics!